Nigeria's Football Federation is backing a challenge to the long-serving President of the Confederation of African Football, Issa Hayatou. Mr Hayatou is standing for an eighth successive term of office, but faces opposition from Ahmad Ahmad, the head of Madagascar's FA. 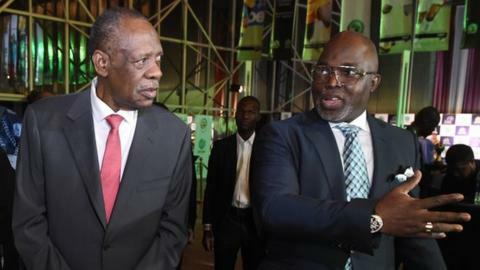 Amaju Pinnick, president of the NFF, told the BBC the election will be "a defining moment for African football". He said Ahmad was "courageous" in coming forward to challenge Mr Hayatou. Pinnick said Caf needs a "new generation" of leadership, following the change at the top of the world governing body Fifa. He cited "post election differences between Gianni [Infantino, the new Fifa president] and Issa Hayatou which are irreconcilable". Infantino will be in Johannesburg later on Tuesday for a gathering of football federation leaders from across the continent. He is then due to visit Zimbabwe at the invitation of the head of the southern African confederation, Cosafa - which also backs Ahmad. Pinnick acknowledged that Hayatou could still win - but said if he did, the veteran Cameroonian would need to be open to different influences. "You have to listen to a larger audience instead of just a tiny cabal, you have to know it goes beyond you," Pinnick said. "I will definitely work with him if he wins but my prayer is we need a bridge builder and that person is Ahmad."